What Types Of Flooring Look Best In The Living Room? In some of our recent blogs, we’ve explored different types of flooring. In An Overview Of Tile Flooring and Hardwood Flooring: The Tell All, we covered everything you need to know about these two flooring options. From the materials you can pick out in each category to how they can be maintained easily, we’ve given you the tell all on these two flooring installation options we offer. However, what if you are looking for a specific flooring option for a certain room in your house? Depending on how you begin the research process, you might start with looking at the best types of flooring for your living room. In today’s blog, that’s exactly what we’ll be doing. Instead of laying out what you need to know about hardwood or vinyl, we’ll cover the best types of flooring that can be laid down in your living room. 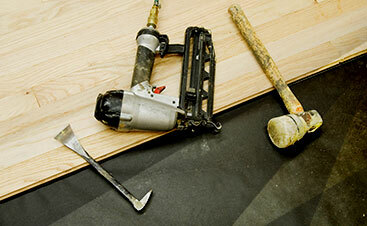 As our Top Rated® Flooring Services will demonstrate, choosing 2 Day Flooring is the right option. Your living room is supposed to be comfortable. It’s generally one of the main rooms of the house. You sit there to read a good book, your kids play in there, the television rests on the wall, and when you have guests over, that’s usually where everyone resides. Your living room should be cozy, relaxing, and an environment that is content. Picking the right flooring option for your living room will take you in this direction. If you choose a flooring option that’s not favorable, then you could negate the entire vibe of what you’re going for in your living room. Before you even do any research for the flooring you should install in your living room, take a moment to ask yourself what type of atmosphere you want in it. Do you want a safe area for your kids to play? Do you want to go a little more modern and incorporate a contemporary vibe? To help you figure out the type of vibe and what would look best in your living room, we laid out some of our flooring installation options you can take advantage of when you reach out to 2 Day Flooring for an installation. Hardwood flooring is a timeless option. You’ll never grow old of having hardwood flooring in any part of your home. What’s great about hardwood flooring is that it goes with anything, it can go more of a vintage route or a modern one, and there are many different species you can choose from. When it comes to hardwood, you can choose from finished or prefinished planks, dark or light species, or you can create unique designs with the floorboards. 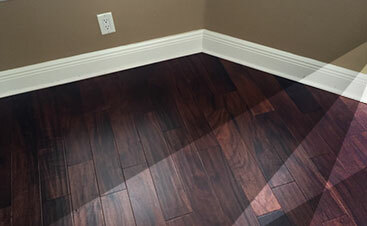 In addition, wood flooring can be used to lighten up, make a room look bigger, or make it look a little more unique. This old world options is refreshing, remarkable, and will leave your living room feeling cozy and exotic. Keep in mind that if you do go with hardwood flooring a little more elbow grease has to be put in to clean the boards and you might want to consider coverings for the feet of your furniture. This option is ideal for folks who don’t have children or animals. If you adore the hardwood flooring look, but you have children or animals, then the laminate flooring is the best option for your home. Laminate flooring has all of the perks of hardwood, but without all of the maintenance and upkeep to make it look beautiful. Just like hardwood, laminate flooring is available in all different types of textures, colors, and durability. It’s a beautiful and versatile choice because you have so many different options you can choose from. If you want to make your living room comfortable for your kids, then add a large area rug. If you want to make it a little cozy, then add some comfortable couches that offset the laminate. If your home is on the smaller side, then add lighter colors and laminate flooring will make it look a little larger. Since laminate is so versatile you can go lighter, darker, or take on a little texture to incorporate a vintage look into your home. Your living room is the place where most people are, so when you clean the laminate flooring you also won’t have to spend hours picking up after spills and accidents because it’s so easy to upkeep. When you think of vinyl, you might be thinking of old ‘50s kitchens. While you can always go a more traditional look in your kitchen with vinyl flooring, the living room is also a great place to install luxury vinyl flooring. Luxury vinyl flooring comes in a variety of beautiful, versatile, and stylish options. Since the living room is a high traffic area, vinyl flooring is perfect because it’s the opportune option for high traffic areas and it’s easy to clean. If you live with a lot of people, have kids, or animals, then we have good news for you. Vinyl is extraordinarily easy to clean. When you choose flooring for your living room, especially when you have a lot of guests over, it’s essential to have flooring that’s stain, dent, and moisture resistant. For vinyl flooring, you can go with a variety of different colors to add more of a tone throughout your living room. You can coordinate the coloring of the floor with your furniture and the artwork on the walls. At 2 Day Flooring, we also do tile flooring installation. These three options are perfect for the living room because it allows you to go in any direction you want. If you want more of a classic and traditional look, then hardwood flooring is ideal. If you want to go with a more contemporary look, then check out vinyl. If you love hardwood, but don’t have the energy to stay up to date with it, then laminate is ideal. With so many options, if it might be difficult to choose, so feel free to reach out to our Top Rated Local® Flooring Services to talk to an expert to get your questions answered.